How Do You Know Which One Is Destroying Your Wood? Do you think you have a home invader chomping through your home's wood frame in the form of a carpenter ant or termite? If so, it would help if you could determine exactly which insect is the culprit. Both can be damaging to your home, but if you want to get rid of the problem, correct identification is the key. Carpenter ants (Camponotus) and termites (Isoptera) share several similarities, not the least of which, is that they both are notorious for causing wood damage in homes. Termites are roughly the same size as the many species of large ants that fall into the carpenter ant group; and like carpenter ants, termites burrow into wood, making them the enemy of your home's wood frame. And because both carpenter ants and termites swarm in the springtime to mate, they are often confused for one another by homeowners spotting the swarms. A closer look at the insect in question will reveal significant physical differences that make it easy to identify a termite versus a carpenter ant. Take a close look at the insect with a magnifying glass or even shine a bright light on the bug and you can use the naked eye. Body shape: If you look at the insect’s body shape, take a good look at the abdomen area. A termite has no "waist,” instead, its body is more rectangular, without any narrowing in the center. In contrast, the carpenter ant has a very well-defined narrow, constricted waist. Wings: Both insects are winged creatures and each has four wings. You’d think, well, that’s not helpful, but honestly this characteristic is actually one of the better differentiating characteristics. A termite has wings that are of equal size and shape and its wings are much longer than its body. A carpenter ant’s back, hind wings are shorter than its front forewings and the wings do not look unusually long or disproportionate to its body. Another thing with termites is that their wings are not as durable as ants. The wings of the termite fall off easily. The loose wings can often be seen near the opening of a termite nest and can be used to identify a termite infestation. Color: Ant workers are reddish or dark-colored and are frequently seen in the open foraging for food. Termite workers, by comparison, are transparent, light or creamy white in color, and they avoid light. Termites are rarely noticed unless their nest is disturbed. The way that the two insects interact with wood is different. For example, termites eat the wood in which they nest. Carpenter ants merely dig into the wood to excavate their nests; they do not eat the wood but simply push it out through openings of the galleries of their colonies. So, if you see small piles of wood shavings or frass (insect waste) below the holes, it helps to identify an infestation of carpenter ants. Carpenter ants seek out moist and damaged wood in which to excavate their nests; termites will chew right into the healthy wood. Another obvious difference is the way the wood tunnels look. The tunnels and galleries of the carpenter ants will be very smooth and finished; termite galleries, by comparison, are rough and ragged because they are filled with layers of soil and mud. Lastly, do you notice any mud tubes? 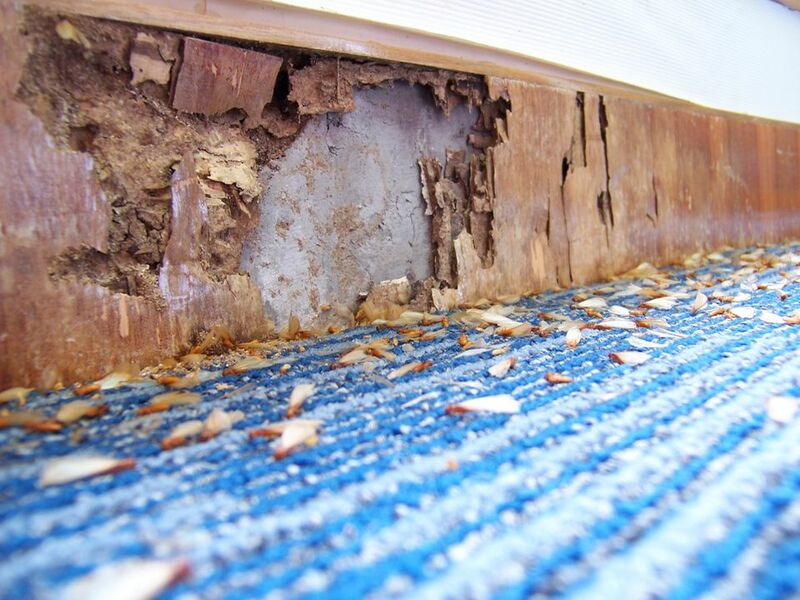 A mud tube indicates the definite presence or previous presence of termites. These are tubes built on the outside of walls or between the soil and wood and serve as the passageways through which the termites travel. Because carpenter ants and termites are so different, effective control measures are also different for each. Carpenter ants can often be controlled through the elimination of the conditions which attracted them, but a termite infestation will generally require professional control. If you do have winged ant-like insects in your home or building, it is best to try to collect a sample for identification. The sample can be used to compare with online photos and graphics, or you can show it to an entomologist or a pest-control professional for identification and recommended treatment. For both insects, control will include a multi-pronged approach using different chemicals to kill existing insects and to repel further infestation. Also of critical importance will be removing and replacing structural wood that has been damaged by the insects. A home's structure can be badly compromised by these insects over time. What Is IPM at Home, School, and the Workplace? What is the Best Way to Use Pesticides Safely Indoors? What Is the Best Way to Prepare for Tent Fumigation?